Brainstorming is an essentialpart of good thinking, and it is also an essential part of coming to good decisions. How does brainstorming help you think better and make better decisions? First, it helps you get outgood ideas and information. Second, it fosters creativity; it encourages people to see possibilities. Brainstorming causes you to stretch to not stop at the first thing that comes to your mind but to keep thinking. Third, it encourages every-one in a group to participate.Fourth, brainstorming is fun, and causes us to get caught up with thinking in away that makes us want to think some more. Brainstorming is a part of many Exploring activities, like developing your year’s program of activities. • Relax. Let pictures freely come to your mind. • Concentrate on what you’re brainstorming about. Try toget everything else off your mind and focus on the subject at hand. •Don’t criticize or judge your own ideas internally. If you do, you’ll start hesitating and being too careful. • Take creative risks; think in terms of no limits. • Believe in and use your own experiences as a springboard for ideas. Each person has all the experiences he or she needs for brainstorming. • Encourage as many ideas as possible. 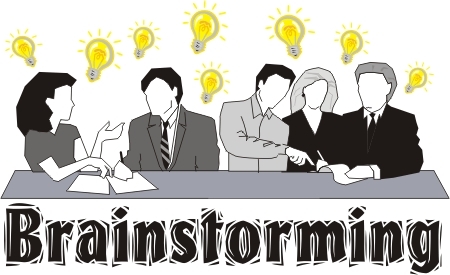 • Don’t judge ideas (as good or bad) during brainstorming. •Don’t look ahead to making decisions; stay totally in the brainstorming mind-set. • Build on one another’s ideas. • Encourage participation from everyone in the group. •Don’t worry about the words you’re using to express an idea. Simply try to describe the picture you’re seeing. •List the ideas that your group comes up with so that you don’t lose them. When you engage in brain-storming, think about the two words that make up this word. Once you experience brain-storming, you’ll realize that it is like a storm in the brain. Ideas begin to flow that you never knew you had—and one idea breeds another idea, and that idea breeds yet another. Brainstorming often surprises people. It blows off the thoughts that lie on top and exposes ideas we are often unaware are inside of us.